Innermedia > Latest News > SEO > What is SEO? Simply put, SEO is a way of helping your website rank well on search engines – since Google is the dominant engine, most efforts are targeted towards their algorithms. Unfortunately. SEO is far from being a simple discipline. It has evolved from the early days of search engines where algorithms were extremely simple, to a point where most online activity is inseparable from SEO and all SEO must benefit visitors as well as search engines. Modern SEO is constantly evolving – Google push out over 300 updates every year, with a major update every quarter or so. Keeping ahead of these updates can be difficult, but ethical SEO ensures that you never fall foul of the rules. There are a number of different elements that make up an optimised site. These include both on-site and off-site elements. 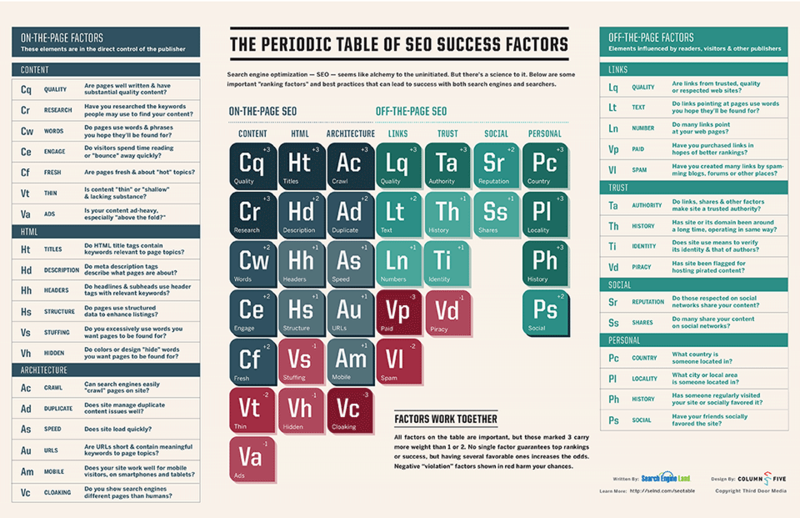 How websites are built and coded has an impact on SEO. The architecture (structure) of a site and the URLs determine how easy sites are to navigate, use, and crawl. While these are separate processes, they are equally important – if your site is easy to crawl but difficult to navigate, it will not serve your users and algorithms will eventually catch up to realise that. Google are already using human raters to look through sites, and a functional design is part of the requirements. The technical side of SEO also includes meta data, which includes information about the page which is only found in the code of the site (and Google searches). While this does not affect on-page experience, it does have an impact on rankings and whether or not people click on your search results. Without good content, your site will not rank. While this was not the case in the past (and search engines are still playing catch up a little), good content is essential if you want your website to retain or gain rankings. Consistent algorithm updates have penalised ‘thin content’ (content that has been duplicated, is of a poor quality, or just isn’t long enough). Google wants the search results to provide real value for users, which is why all of the information needs to be unique and authoritative. If it isn’t, why would Google want to show you to their users? What marks you out from the hundreds (if not thousands) of other sites who want to rank for the same thing and gain traction with the same audience? Authority means a lot online, but there are a limited number of ways for a computer to understand authority. One of the markers is how many people are talking about you – social media is the best way to measure that. Some social media platforms are relatively closed to Google (such as Facebook) while others are owned by them or reasonably easy to crawl. One of the best ways to use social media to reinforce your SEO is to use a G+ account consistently – getting +1s and shares on this network is a great way to boost your search results and improve your standing in the eyes of Google. Like authority, reputation means a lot. Like everything else about SEO, this has evolved. Once upon a time, it meant that you just needed to earn a lot of links. Now, the type of link and reason for it counts too. Links from poor sites can actually undermine your SEO rather than helping it, while a single link from a .gov site or an accrediting body can do wonders. As sites are rated by humans as well as machines, articles that paint your brand in a negative light will have a negative impact on your reputation, even if they’re on a fantastic site and feature a link back to you. In short, Google do not want to feature companies that do not treat customers well. Gaining reviews across a number of verified sites is a fantastic way to boost your online reputation, both for users and search engines. Linkbuilding is one of SEO’s most misunderstood practices. When algorithms were young (and fairly simple), this was widely outsourced to other countries with cheaper staffing costs or simply run by bots who spammed forums, recycled articles, and generally provided no real value with their linking. It improved search results, but spawned thousands of websites whose sole purpose was to link out to others. Now links are earned with fantastic content and good relationships. If your link doesn’t provide value to the site’s users, and there’s no reason for a site to link to you, it’s safe to consider it a bad link. A poor strategy can actually land you with a manual penalty and eliminate you from the search results. None of these elements can really be used in isolation – they need to work together to form a coherent SEO strategy and help you rank. Social media strategies are tied to your content strategy, which in turn is tied to your link building. Your reputation is tied to all of these, and the technical side provides a foundation to all of your SEO work. Ultimately, all of your online work contributes to your SEO if you use intelligent processes and have a coherent strategy to work from.